Okay, I know last week I said page 3 was my favorite of this story, but now I think we have a new contender. It’s entirely possible I’m the only one so terribly amused by this story, but I don’t even care. Denver Brubaker’s toddler spin on my designs cracks me up . 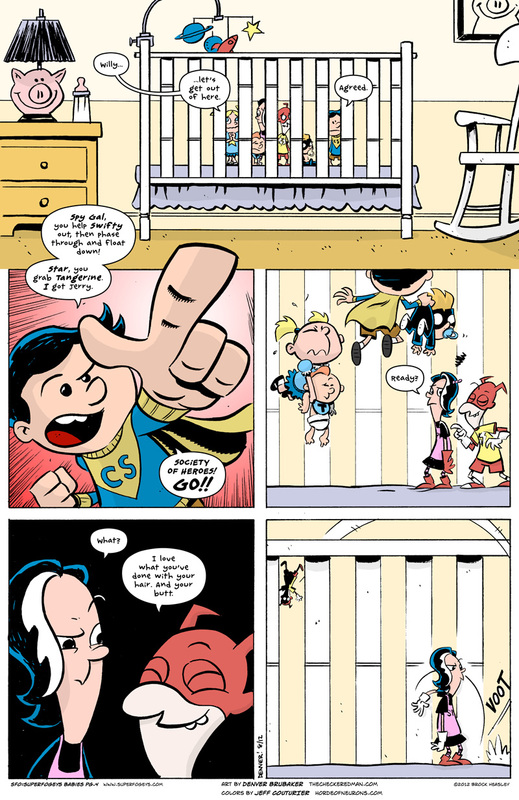 And Jeff Couturier’s colors really make the page sing. The black and white looks cool, but Jeff adds quite a bit to the proceedings. Does baby Tangerine still pop open heads? Can SpyGal phase more than just herself? Even if she can, I gotta say I love when SpyGal starts tossing people around. I am loving this story way too much. Many thanks! It’s a lot of fun to make!